Monoprice 10565 Premium 5.1 and Energy Take Classic 5.1 are both speaker sets for building a home theater system. As hinted by those names, they both support 5.1-channel. Despite the very visible difference of physical appearance, Monoprice 10565 Premium 5.1 and Energy Take Classic 5.1 are quite similar in the rest of their characteristics. In general, though, Monoprice 10565 is cheaper than Energy Take Classic 5.1. Thus, a lot of people have been questioning whether they should purchase Monoprice 10565 Premium 5.1 or Energy Take Classic 5.1. Read also: Klipsch HD Theater 600 Vs Energy Take Classic. Energy has been in the audio equipment field since several decades ago, dating back to 1973. Their products are widely known to provide superior quality, and Energy Take Classic 5.1 is not an exception. It features four 2-way satellite speakers, one center channel, and a 200-Watt subwoofer with front firing port design, 8-inch driver, and the patented Ribbed Elliptical Surround technology. The mentioned feature functions to increase excursion as well as to eliminate distortion, increasing its efficiency in the audio reproduction. The recommended amplifier strength is 20 – 100 Watts. Rest assured, with such power and configurations, Energy Take Classic 5.1 sounds excellent: full, rich, powerful, and accurate. It can be great for both large and small rooms, and is wall-mountable. On the other hand, some people criticized Monoprice 10565 Premium 5.1 as a copy of Energy Take Classic 5.1. 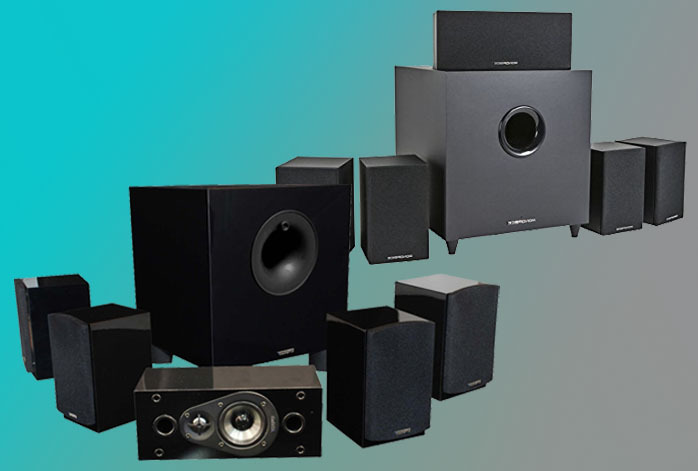 Seeing the sets side by side, you may notice the similarities, especially since Monoprice 10565 Premium 5.1 also comes with four 2-way satellite speakers, a center channel speaker, and an 8-inch subwoofer. However, its subwoofer differs slightly in design, since the subwoofer here is down firing. Though the difference between front firing and down firing subwoofer is largely unnoticeable, and most people tend to consider them both as the same, a front firing subwoofer is more preferable, because a down firing subwoofer may be affected by the gravity after some long time and is slightly less efficient. In terms of audio output quality, we can say that Monoprice 10565 Premium 5.1 and Energy Take Classic 5.1 are equal. Nonetheless, for some better efficiency and durability, Energy Take Classic 5.1 is the way to go.